During this year’s IPW in Denver, May 19 – 23, be sure to find out what is next for Las Vegas’ most advanced mass transit option, the Las Vegas Monorail.At IPW booth No. 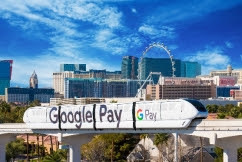 1861, Monorail executives will be available to discuss how this low-cost, high-efficiency, driverless transportation option featuring zero-emissions trains recently became the world’s first transit system to fully integrate its ticketing with Google Pay using MIFARE contactless technology. The Monorail’s system is more important than ever to the transit landscape of Las Vegas, particularly in the face of new major event facilities opening on the Strip. Last fall saw the inaugural season opener of the brand-new Vegas Golden Knights National Hockey League franchise at the T-Mobile Arena, which will also be home to the Las Vegas Aces Women’s National Basketball Association team; the T-Mobile Arena is accessible via the MGM Grand Station. Meanwhile, 2020 will bring the opening of the Las Vegas Raiders’ National Football League stadium, which is currently under construction just west of Mandalay Bay. Mobile Ticketing: This year, the Monorail introduced mobile ticketing for Android users via Google Pay, becoming the world’s first system to fully integrate its ticketing system with the popular Google app. Meanwhile, Apple phone users can also purchase and use tickets electronically using the Monorail’s Scan-and-Go technology. Fare Integration Technology for Conventions: The Monorail partners with conventions and tradeshow organizers to load Monorail fare directly into attendees’ registration badges. Attendees can just scan their badge and ride the Monorail. Private “Shuttle Trains” for Groups: Meeting planners can arrange to privatize Monorail trains to offer their guests dedicated transfers from hotel to convention center, or anywhere else along the system’s 3.9-mile route. Ridership: Carries 5 million passengers annually; 81 percent of riders are leisure travelers and 19 percent are business/convention visitors. Zero Emissions Trains: In 2017, the Las Vegas Monorail aided in the annual removal of an estimated 2.2 million vehicle miles from Southern Nevada’s major roadways, reducing emissions by more than 28 tons of carbon monoxide (CO), volatile organic compounds (VOC) and nitrogen oxides (NOx) over the course of the year.